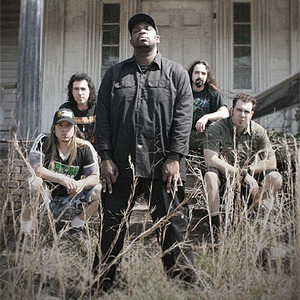 Stuck Mojo is a rap metal group from Atlanta, Georgia. They were formed in 1989 by guitarist Rich Ward and original bassist Dwayne Fowler. Lead vocalist Bonz joined later in the year. They released their first album, Snappin' Necks, in 1995, with Century Media Records. In 1996 they released the Devin Townsend produced Pigwalk alongside new bassist Corey Lowery and drummer Bud Fontser?. Their fame was minimal until the release of their 3rd album, Rising. In 1996 they released the Devin Townsend produced Pigwalk alongside new bassist Corey Lowery and drummer Bud Fontser?. Their fame was minimal until the release of their 3rd album, Rising. The album sold over 50,000 copies and remained Century Media's highest selling album until 2004, when Lacuna Coil's 5th album Comalies broke that record. The band's love for professional wrestling was especially exhibited through this album, as World Championship Wrestling's U.S. Heavyweight Championship belt was prominently featured on the cover. Also, the video for the song "Rising" featured then-WCW stars Diamond Dallas Page and Raven. Despite critical praise and good sales of their follow-up albums, Stuck Mojo broke up in 2001 but continued to perform New Year's Eve reunion shows every year at the Masquerade Club in Atlanta. Bonz later joined the bands 420 Monks and Dead Gospel. Ward, Fontser?, and former bassist Dan Dryden joined WWE wrestler Chris Jericho's band Fozzy and another band called Sick Speed, and Corey Lowery joined Life of Agony, Stereomud, and Dark New Day. Rich Ward released a solo album under the name "The Duke" on May 3, 2005. Stuck Mojo are considered pioneers of the nu-metal subgenre, and are considered an influence by many popular nu-metal groups. In 2005, Stuck Mojo reunited, with Bonz, Ward, and Fontser? back in the lineup, with new bassist Sean Delson replacing Dan Dryden. Current plans include a new album, titled "Southern Born Killers", as well as a full-scale tour. Fontsere has since left and been replaced by Eric Sanders along with frontman Bonz being replaced by Lord Nelson. Their latest album, "Southern Born Killers", has been released for free legal download from their official site.